The San Juan Basin is a large, roughly circular, depression that lies in the northwest corner of New Mexico, and is a part of the larger Colorado Plateau. 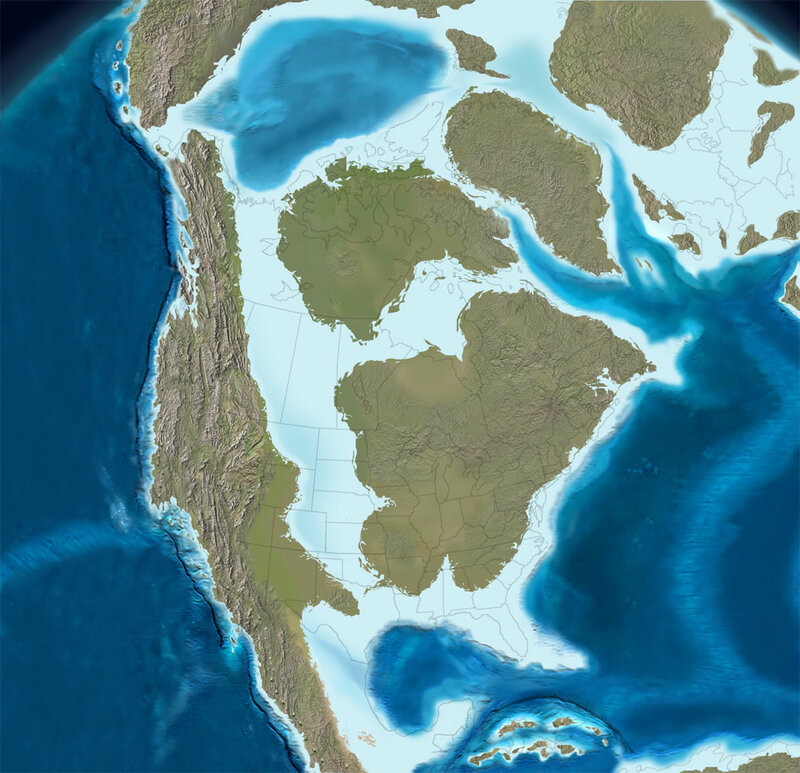 What makes the basin special is the fact that, at one time, it was in an area that was covered by the Western Interior Seaway, a prehistoric body of saltwater that split the North American continent from top to bottom. The location along the shores of a large body of water in a tropical climate allowed an incredibly diverse ecosystem to thrive. As these life forms died, they decomposed and were eventually covered by volcanic ash from the eruption of nearby volcanoes. As the seawater covered the area more sedimentation sifted over the remains and some of the sediment was infused with mineral rich water that seeped through the layers above making it harder than the surrounding matrix. 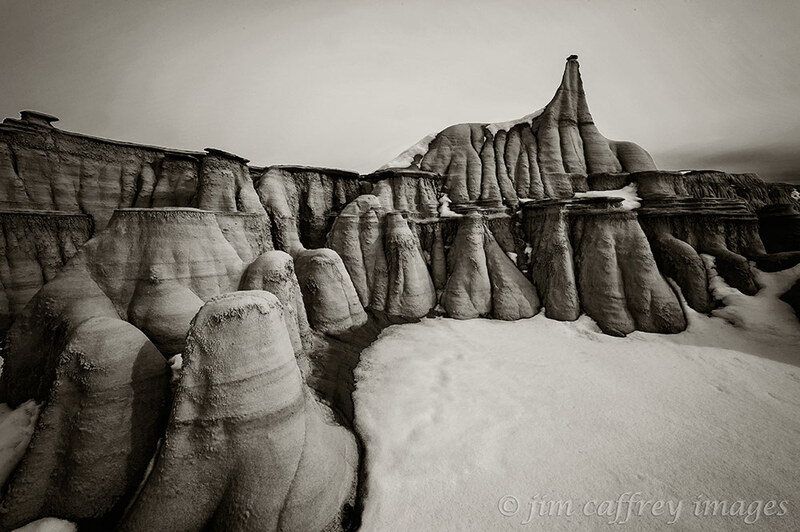 This was an important step in the formation of the present-day hoodoos. The weight of the water compacted the entire assemblage, and it was lost to the the world above the waves. About 65 million years ago, the waters receded and a layer of sediment nearly two miles thick was left behind. Since then, plate tectonics, volcanism, and glacial erosion have helped to shape the present-day San Juan Basin. Further erosion from wind, water, and annual freeze/thaw cycles exposed the hardened sediment layers which eroded more slowly than the softer sand/ash matrix. 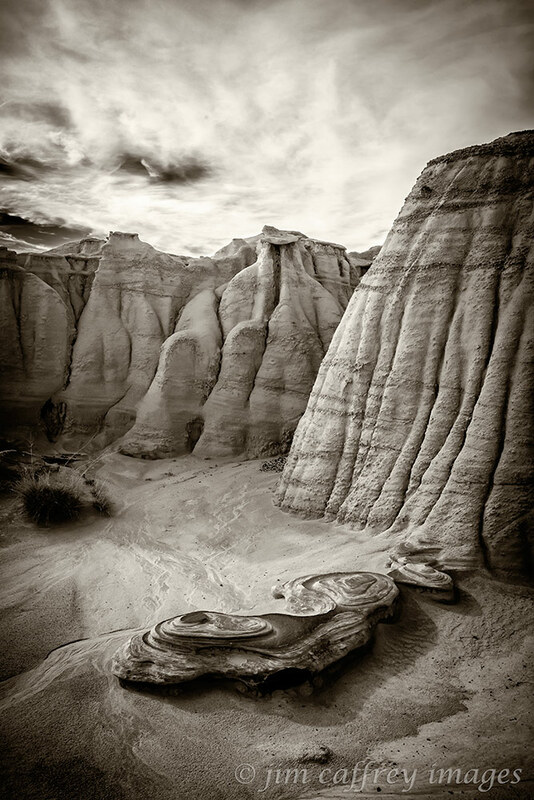 The result is a wonderland of hoodoo gardens that are especially obvious along the edges of the many washes that criss-cross the basin. Some of these drainages such as Ah Shi Sle Pah, Hunter and Alamo–the two washes that formed the Bisti, and their tributaries have carved and exposed a treasure trove of unlikely works of earthen art. The human history of the badlands is of course relatively short. Probably the most significant event in shaping the area in the last hundred years was the discovery of coal and the associated coal-bed methane. By the early 1980’s coal mining, mostly to fuel the nearby Four Corners Power Plant, was consuming large tracts of land throughout the basin. Inevitably, the Bisti became the center of a lawsuit between the Public Service Company of New Mexico and the Sierra Club; PNM already had a mining operation there and it looked like it might become just another large open-pit mine. 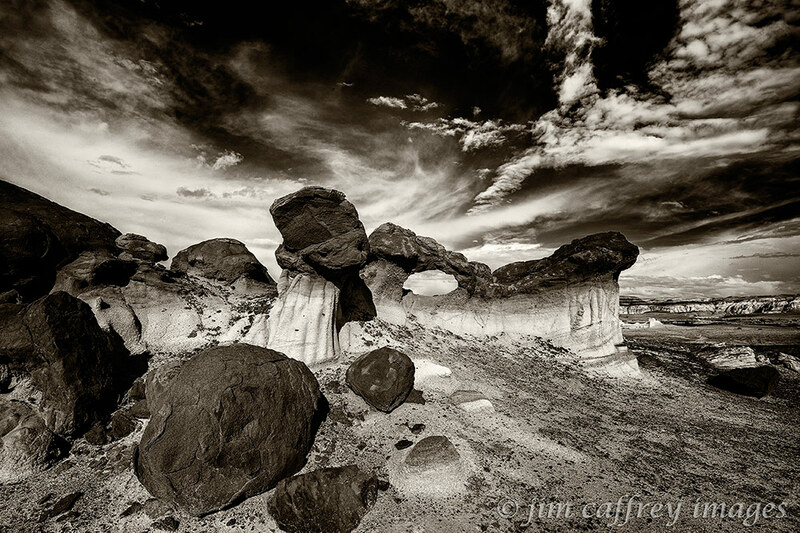 However, the courts sided with the Sierra Club and in 1984, the Bisti was awarded wilderness status. In recent years, Ah Shi Sle Pah has also become a Wilderness Study Area. So, at least for the present, these gems are safe from the insatiable maw of “progress”. Of the nine recognized badlands in the San Juan Basin, the Bisti is the largest–at 30,000 acres–and most well known. It includes the Kirtland and Fruitland geologic layers and was deposited 70-75 million years ago. The chief deposits are: sandstone, siltstone, shale, coal, and volcanic ash. Fossils include remains of T-Rex and large cypress-like conifers. Ah Shi Sle Pah is much smaller than the Bisti, but was deposited around the same time, and thus contains the same geologic layers. It contains the same deposits: sandstone, siltstone, shale, coal, and volcanic ash. The fossils found in Ah Shi Sle Pah include remains of crocodiles, Pentaceratops (which has been found only in Ah Shi Sle Pah), early mammals, and of course, petrified wood. The other recognized badlands in the basin are: Ojito–the oldest having been deposited 144-150 million years ago–, De Na Zin (70 -75 million years ago), Lybrook, Ceja Pelon, Penistaja (all 60-64 million years ago), San Jose (38-64 million years ago), and the youngest, Mesa de Cuba (38-54 million years ago). 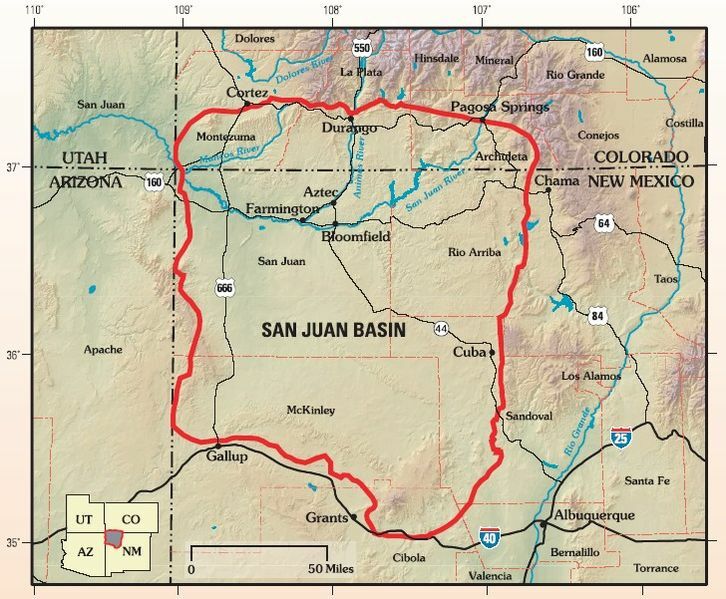 The map shows the boundaries of the San Juan Basin. Rather than being formed by volcanism like the San Juan and Jemez Mountains to the north and east, the basin was uplifted as a single block after which the center collapsed to create the basin. 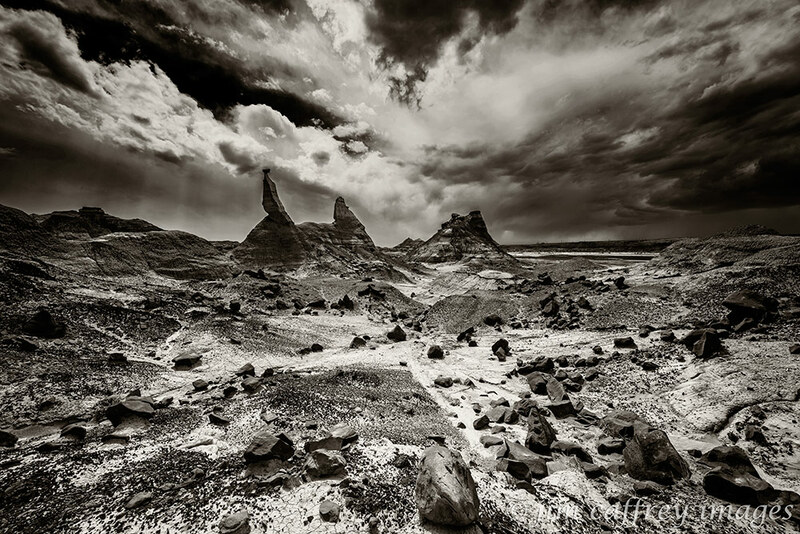 The idea for this post came from a show I had last year called Badlands Black and White. I chose to print all the images in B&W in order to focus on the graphic elements: tone, texture, patterns, etc. 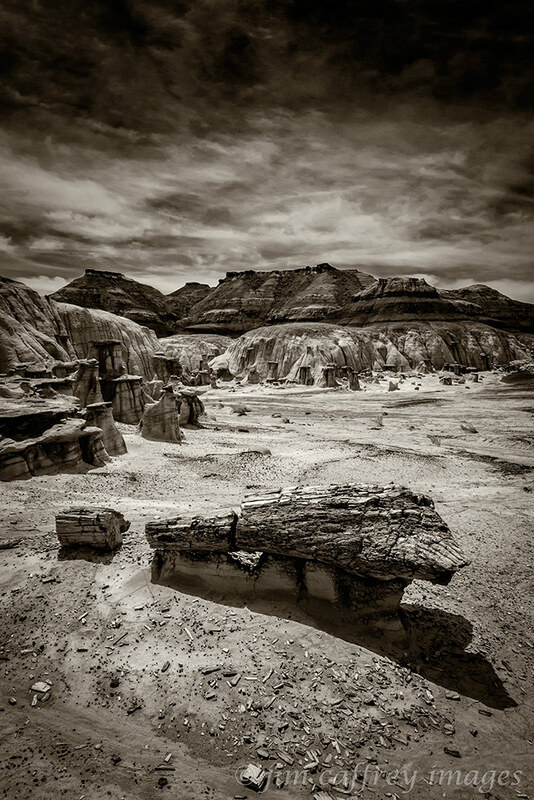 This image was made in Alamo Wash in the Bisti Wilderness. The cracks that result from the shrinkage of the clay rich soil tell a story of the arid environment. The sandstone balanced on the short mudstone pillars is an example of the hardened sediment and how it weathers in relation to the softer layers below it. The floor of most badlands is usually littered with small pieces of debris, which is comprised of bits that have broken or eroded from larger structures. They can be shale, clinkers (super-heated clay), siltstone, or even glacial deposits from the last ice age. There are often fossilized bone and clamshells mixed in with all or some of the above. 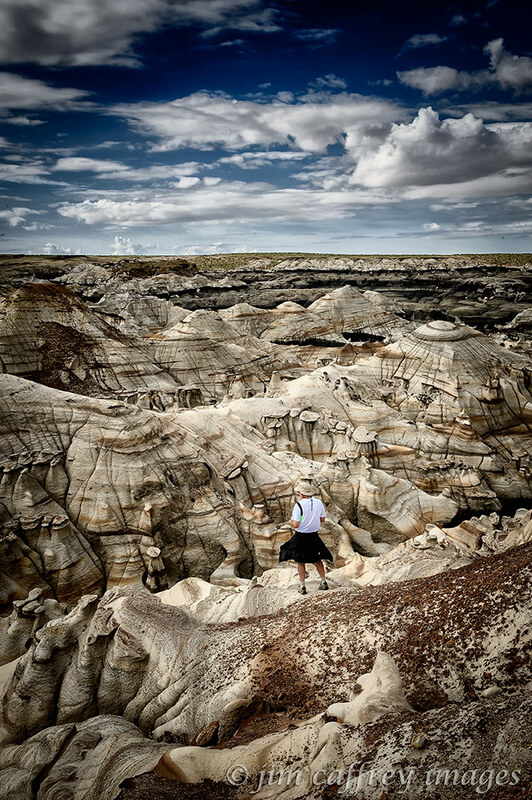 I made this image of a client while leading a tour in the Bisti Wilderness. The man is standing on an ridge above a deep wash in the Brown Hoodoos section of the wilderness. I wanted to give the viewer a sense of scale and the feeling of being lost in the bizarre surroundings. These eroded pillars are in a small alcove located in a tributary of Ah Shi Sle Pah Wash. Some of them still have their sandstone caprocks, while some have lost theirs. The badlands are an evolving story of creation and degeneration, once the protective cover of the caprock is gone, the erosion process proceeds at a much faster pace. This image is from Ah Shi Sle Pah Wash. The squat hoodoos in the foreground are relatively new and haven’t weathered out to the extent that some of the taller, more widely spaced ones have. 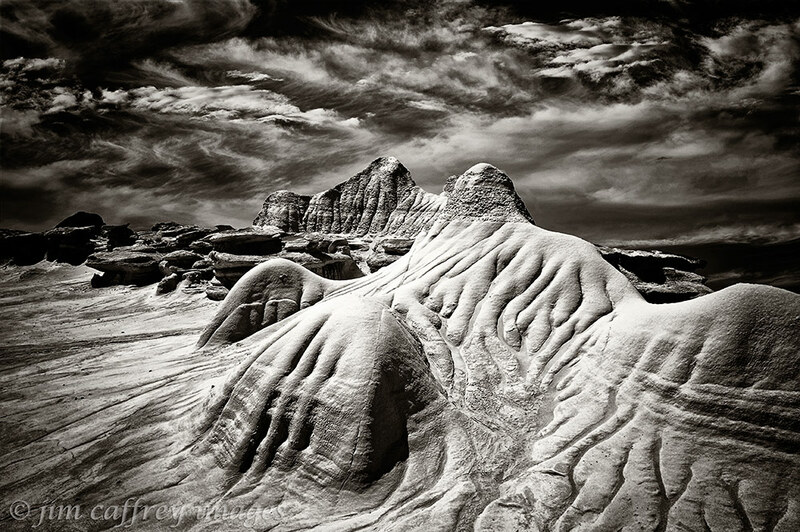 Like many of the places I frequent in the badlands, I can’t visit this one without making several exposures. At Ah Shi Sle Pah, there is a small, raised enclosure; I call it the Dragon’s Nest. What caught my eye the first time I saw it were the patterns and textures eroded into the solidified volcanic ash. This formation, at some time in the past, probably had a sandstone cap-rock. I made this image in Ah Shi Sle Pah Wash. 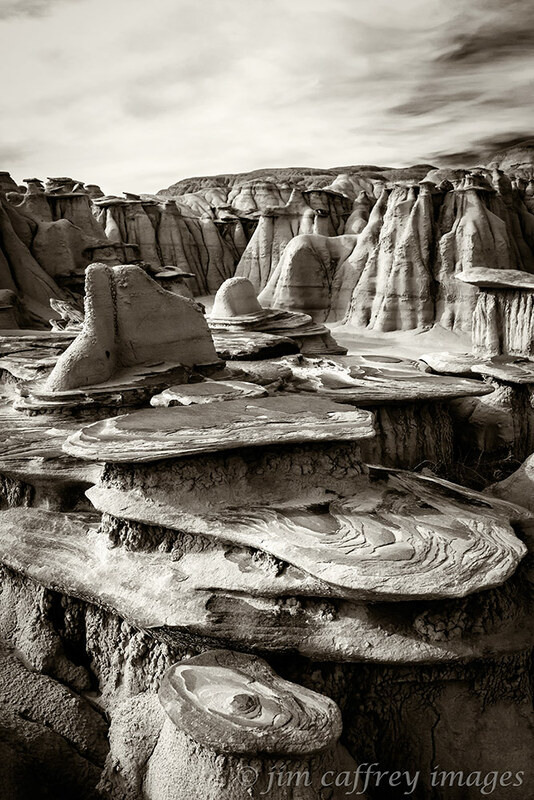 This collection of hoodoos sits in the middle of a labyrinthine tributary wash. The small column on the right has lost its caprock and is undergoing accelerated erosion. 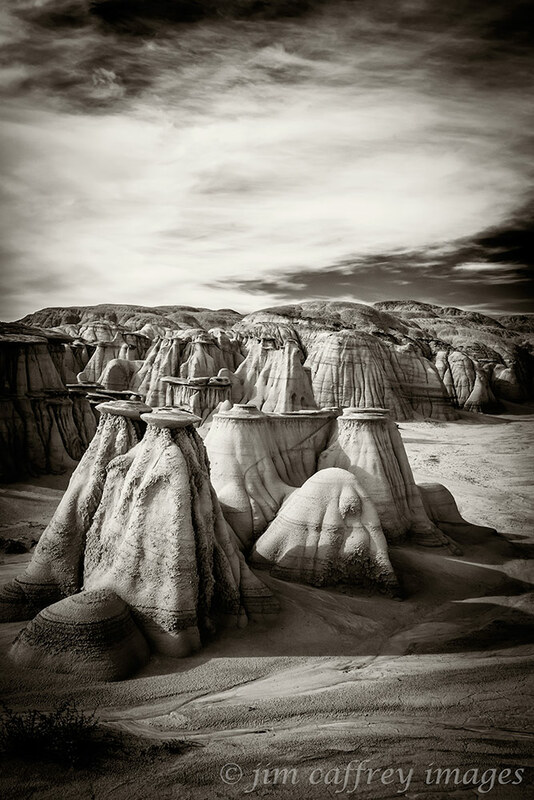 This is a formation in the Bisti Wilderness that I call the Queen Bee. It is part of a small area of similar formations known as the Egg Garden. The cylindrical shape of these eroded forms is due to them being formed and hardened inside limestone tubes. As the surrounding layers eroded away, they emerged as distinct egg-shaped forms. 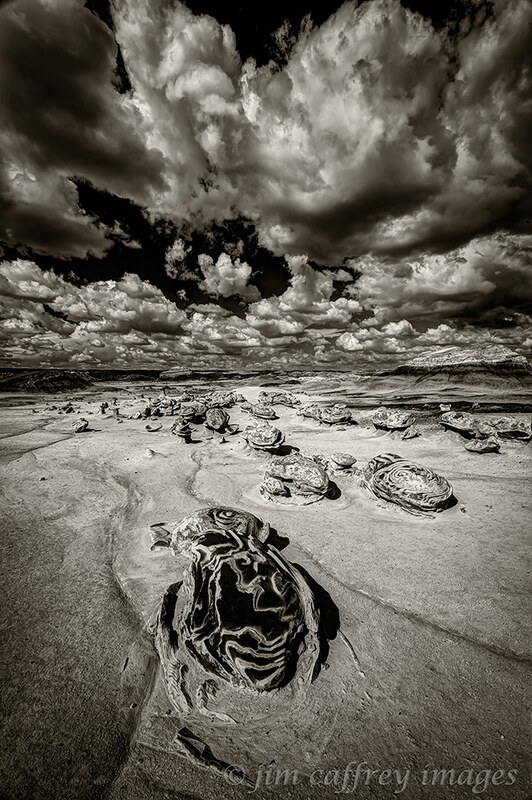 The Egg Garden is one of the most popular attractions in the Bisti. This small arch is another feature that brings people come from around the world to visit the Bisti Wilderness. 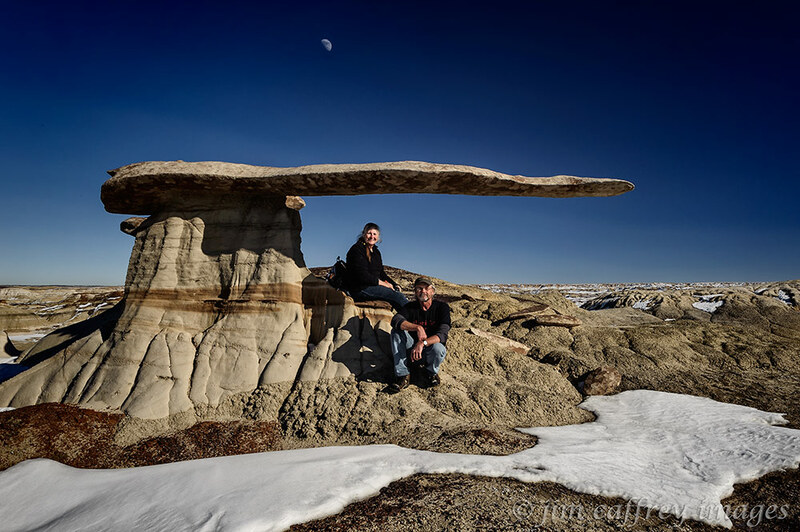 The Bisti Arch can be deceiving; the opening is only about three feet across and half as high. The first time I found it, after searching unsuccessfully during previous visits, I was surprised by how small it is. The top of the arch is made of siltstone supported by a volcanic ash pedestal, and was once part of a wall which stretched across Alamo Wash. 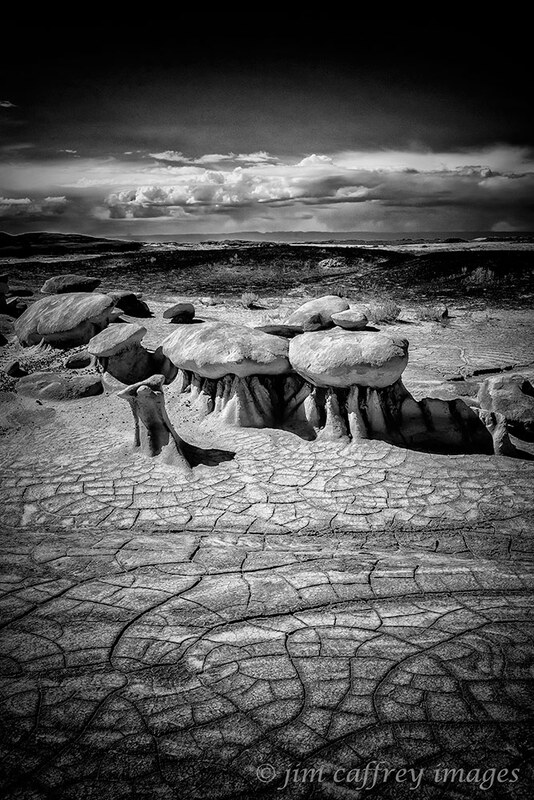 In his book “Bisti” which was printed in the 1980’s, David Scheinbaum included an image of this formation with the caption: “This unstable hoodoo is just within the Sunbelt coal-mining lease and will probably be destroyed by mining in the near future.” I made this image on a recent trip to the Bisti Wilderness, and I’m happy to report that the unstable hoodoo is still standing. It has been well documented that color steals the show when it comes to viewing a photograph. I have written about this previously, but as I have evolved as an artist, my ideas concerning visualization have also progressed. When you look at the two versions of the image below, what is the thing that grabs your attention? What is it that makes one version better or more visually pleasing to you? Do you have the same emotional response to both, or do they each evoke a different reaction? I love the shade of green in the color photograph. All the variations of shading change subtly from one tone to the next, the trees in the background are almost an afterthought. It is a relatively peaceful image. The second version is rendered in black and white. There is more tension between the elements because the background trees are no longer visually less dominant. 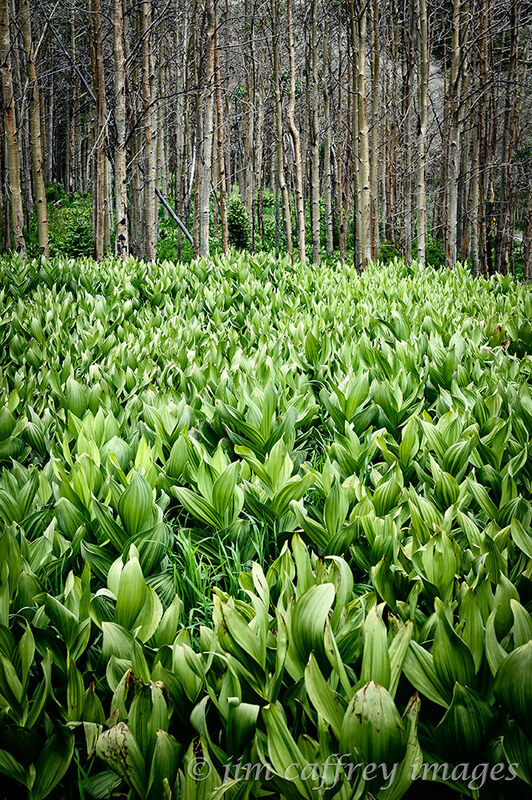 Their repetitive verticality vies for attention with the more random shapes and lines in the False Hellebore in the foreground. The contrast in tonality is also more obvious in the second version, making the image more visually aggressive. I don’t mean to say that the black and white image is more successful in portraying the feeling I had when I recorded the scene, I am just pointing out that each version places more emphasis on certain elements in the composition. The result is two separate realities (apologies to Carlos Castaneda) that convey two different emotional responses to the same subject. Telling a story about a place using images isn’t necessarily as straightforward as it may seem. There are many layers of information; some need to be added to, others subtracted from. In the case of the badlands of the San Juan Basin, the latter is the case. The landscape itself is in fact formed by subtraction. It is eroded by the force of wind, and water over time. Things are not always as they appear. The tree trunk in the first image is no longer composed of wood; it has, over time, become transformed by minerals that replaced the dead organic matter, making it a petrified semblance of its former self. This layered channel sandstone was infused with minerals which leeched into the ground making it harder than the surrounding matrix. As the accumulated sedimentation eroded, the harder stone was left exposed. Much like the landscape, these photographs were created by removing some of the information, more specifically, the color. 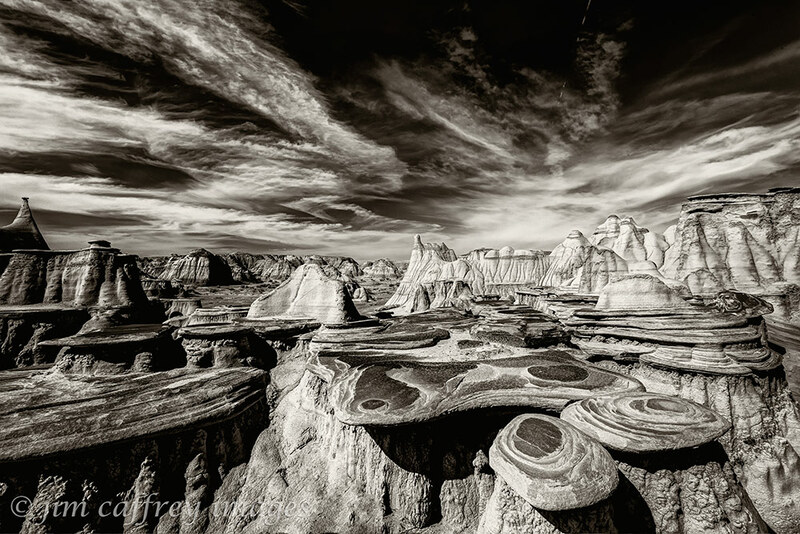 A black and white image presents the bare bones of the subject and allows the viewer to see the underlying structure. Most of us are subconsciously influenced by colors. We make associations between colors and a certain emotion or mood, so removing the color eliminates the preconceived idea, which in turn leaves us free to experience an image in a more visceral way. The badlands are a visual experience; the textures, shapes, and patterns inherent in the stone and clay are extraordinarily diverse. So, whether the image is one of more intimate proportions as in this photograph of a small alcove in Ah Shi Sle Pah, or of a grander scale like the image of the Bisti Arch shown below, the simplicity of the black and white image allows the landscape to stand on its own merits. And while the yellows, reds, browns, greens and magentas which paint these amazing places with an astounding palette, play a role in telling the whole story, the absence of those colors conveys the essence of their austere beauty. Yesterday I cleaned my cameras and lenses…all of them. It took me all of the morning and part of the afternoon. I hadn’t handled my Nikkormat FTN in quite a while, but it felt like an old friend which, in fact, it is. It is the first SLR I ever owned; I bought it in 1971 at the PX while I was overseas. At that time, the FTN was a favorite of photojournalists covering the Vietnam War because of it’s sturdy construction. It is now considered a classic. 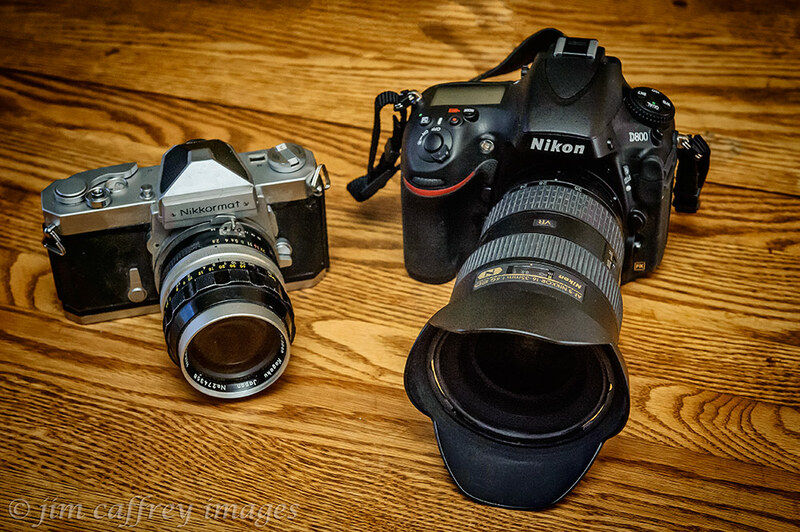 While I had it out I decided to pose it next to my latest DSLR–a Nikon D800. The juxtaposition started me thinking about how photography has changed over the forty plus years since I bought that Nikkormat. There have been many upgrades to the Nikon line in that time; I own several of them: two Nikkormat FTNs, an F3, and two F 100s. But, the changes over the past ten years have actually been a paradigm shift. Of course I’m referring to the advent and rapid growth and development of digital photography. I wanted to do a comparison of the work I was doing then and the work I’m doing now, so I dusted off my collection of old negatives and prints to see what I could find. 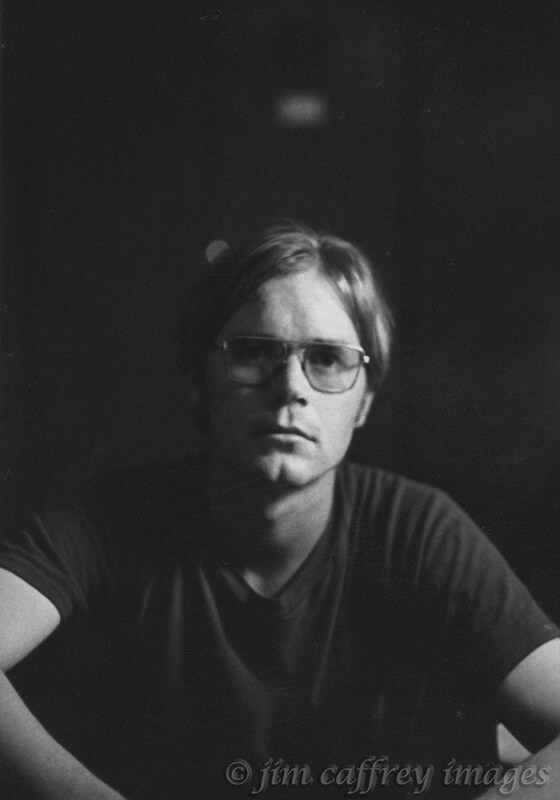 In those days, I shot primarily Kodak Plus X (ASA/ISO 125) and Kodak Tri X (ASA/ISO 400). I developed and printed all of these early images in a “wet” darkroom, and although I get a bit nostalgic looking at them, I don’t regret my switch to the digital realm. True to form, once I crossed over I never looked back. This is a self-portrait I made just before I was discharged from the army. I was really into dramatic side-lighting at that time. I made dozens of portraits of friends from my unit and they are all lit the same way. When I shoot portraits now, I usually use at least one flashgun, on camera or off, umbrellas, reflectors…Seeing these simple available light images makes me realize how effective that kind of lighting can be. I do miss the catchlights though. My friend Kim Bong In and I went to Inchon to do some sight-seeing. 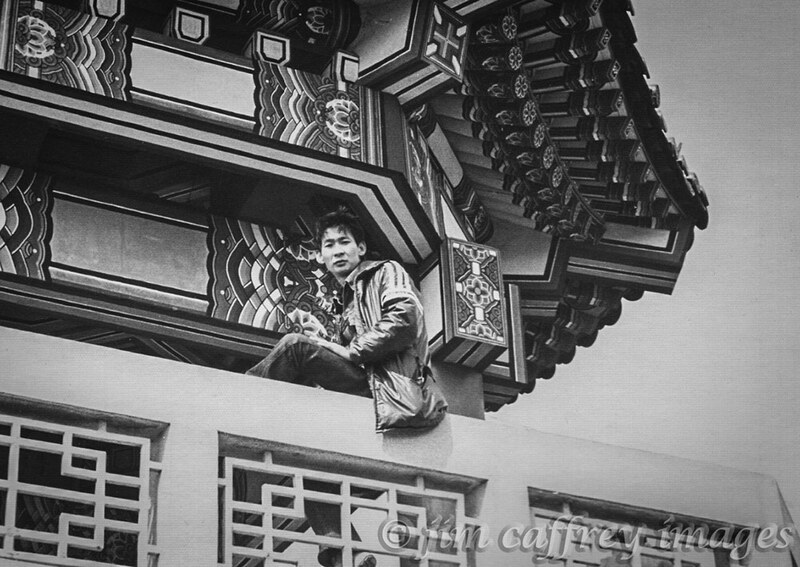 I made this portrait of him at the Inchon Memorial Pagoda. Kim was a DJ at one of the clubs in Tongducheon which is the village next to Camp Casey where I was stationed. He and I became friends during the time I was there, and he introduced me to everyday Korean life, the one beyond the clubs and “working girls” which is all most GIs ever saw. I went to his grandfather’s funeral and was invited to the celebration when his son was born. 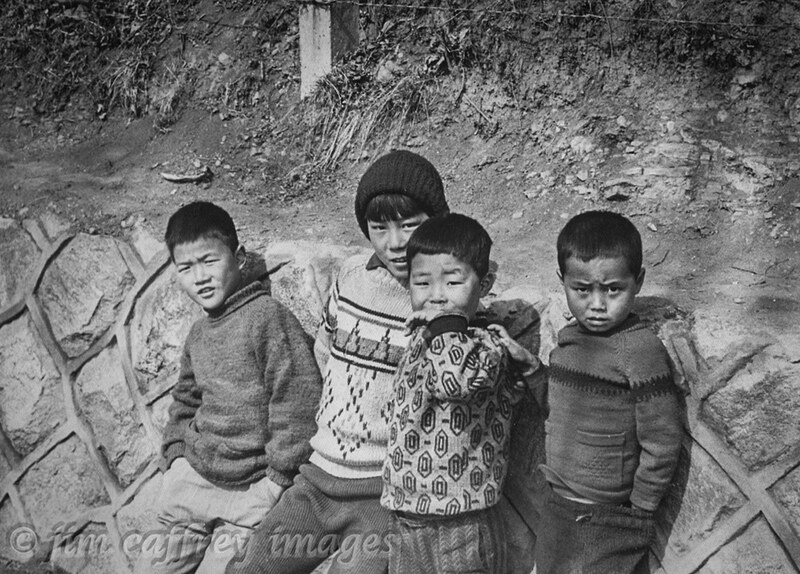 I caught these four young chin-gus (friends) hanging out on a busy thoroughfare in Inchon. Their expressions were all over the map: unguarded disdain, shy curiosity, nervous apprehension, watchful suspicion. Ours was a brief encounter; they went their way and I went mine. But, looking at this image more than forty years later, I wonder how their lives have played out. I wonder if the expressions they wore that day reflected the men they would become. Once you made your way beyond the section of the village that tailored to the American servicemen, you found yourself in a different place and time. 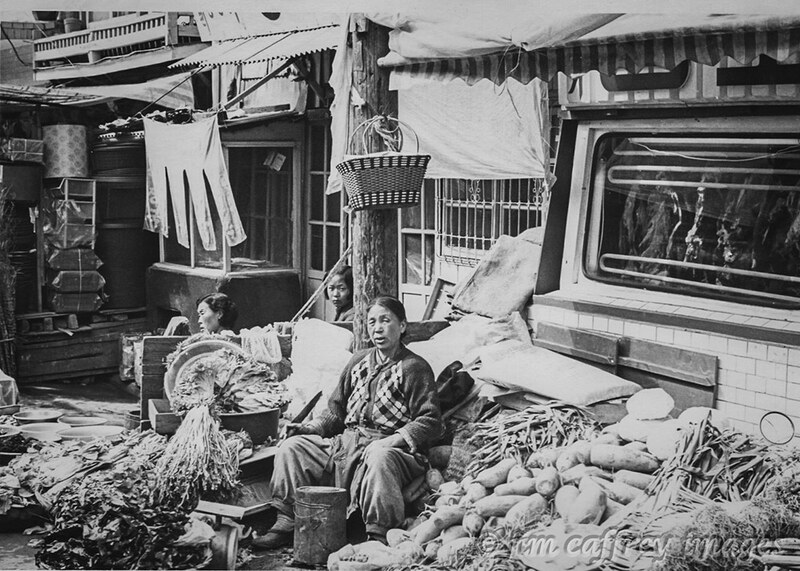 There were no supermarkets, the people bought their food at small street markets like this one. The woman in the center of the image was obviously in charge. Her produce is arranged rather haphazardly around her, cuts of meat hung in a display window. I was telling a story here. I was in a photojournalistic frame of mind. 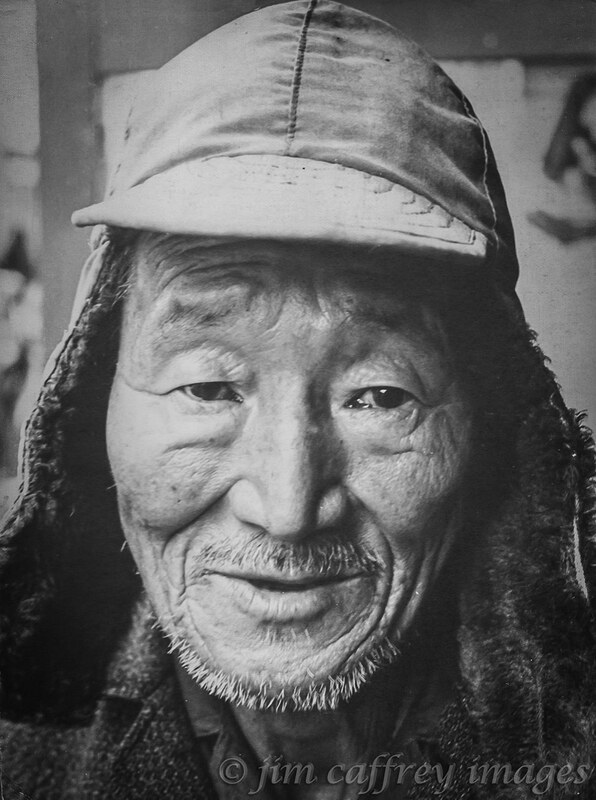 I got to know this Korean elder through regular interaction with him in the village. We communicated with pidgin Korean and English. I don’t remember his name, but he was kind enough to pose for this portrait. The one thing I don’t care for in this image is the slight motion blur. Because I was pretty new to shooting with an SLR, my camera technique was not very good. I remember that I usually shot somewhere between 1/125th and 1/200th second, but there were times when I would end up down around 1/60th and this was probably one of those times. Fast forward to 2014. 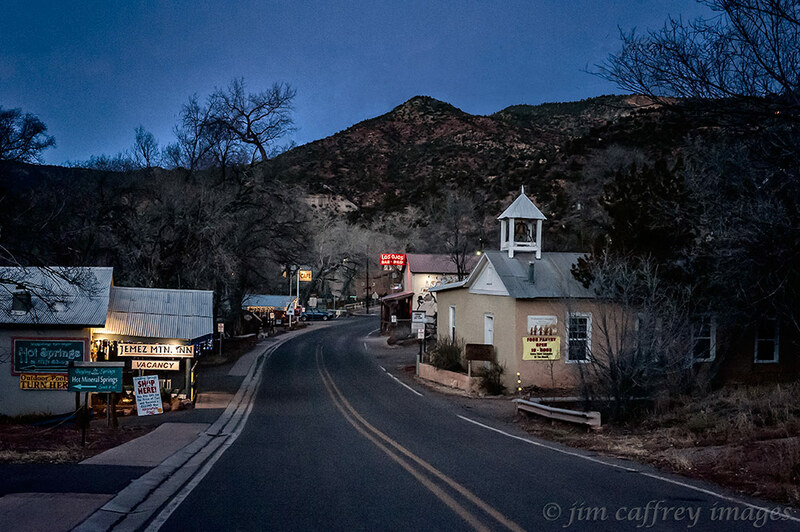 I have lived in the small village of Jemez Springs, New Mexico for thirty-nine years. Not much has changed as far as the eye can see. It’s a sleepy place, especially on a Wednesday night in January. I handheld my camera while making this image. I dialed the ISO up to where I needed it to get a suitable shutter speed with an aperture of f8. I reduced what noise there was in Lightroom. This would not have been possible with the available technology just a few years ago, let alone in the 1970s. I’m not big on self-portraits. But, there are times when the location demands one. I spent several years trying to find this stone wing which is located deep in the heart of the San Juan Basin. When I finally located it with some help from a photographer from southern California using Google Earth, the actual experience was a bit anti-climactic. I decided to pose Robin and myself under the cantilever with the waxing gibbous moon overhead. One thing I’ve learned over the years is that if you want to make good portraits, you need to be able to engage your models. It’s not the easiest thing to approach a stranger and, in a short time, make him comfortable enough to open up to you. 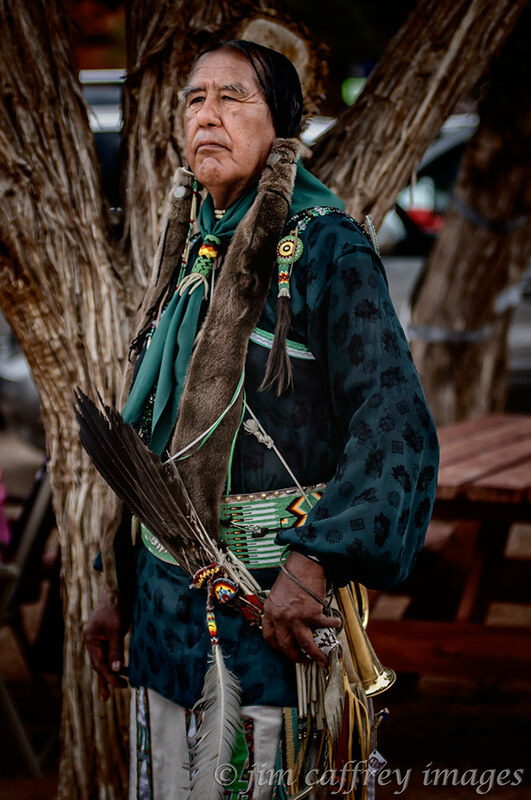 So, when I saw this fellow at a powwow last year, I went over and started talking to him. Predictably, he was a bit stand-offish at first, but after a while, the walls came down and he agreed to pose for me. 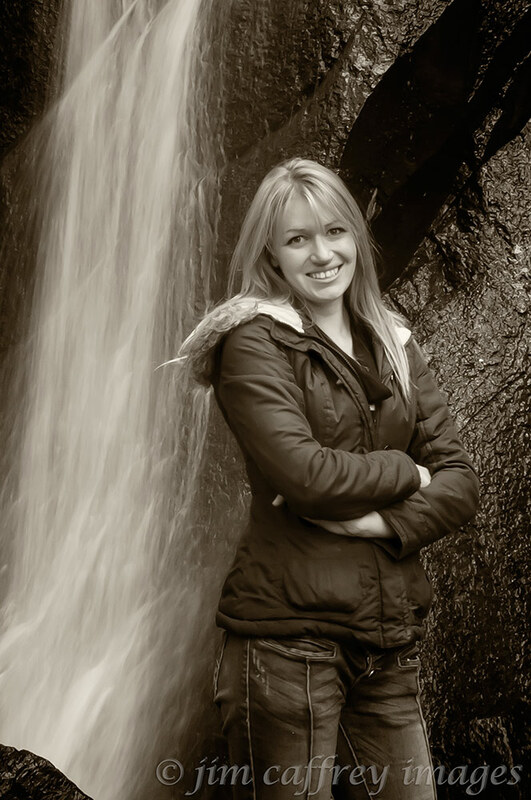 My youngest daughter Susan is a natural when it comes to modeling. I made this image of her at a waterfall not far from my home. It was shot RAW as are all of my images; I converted it to black and white and added a sepia split tone in post processing. This kind of control over the ultimate look of an image is only possible by taking advantage of a RAW workflow. At the end of last summer, I travelled to Wisconsin where my daughter and her husband live. We spent part of that time in Bayfield on the coast of Lake Superior. 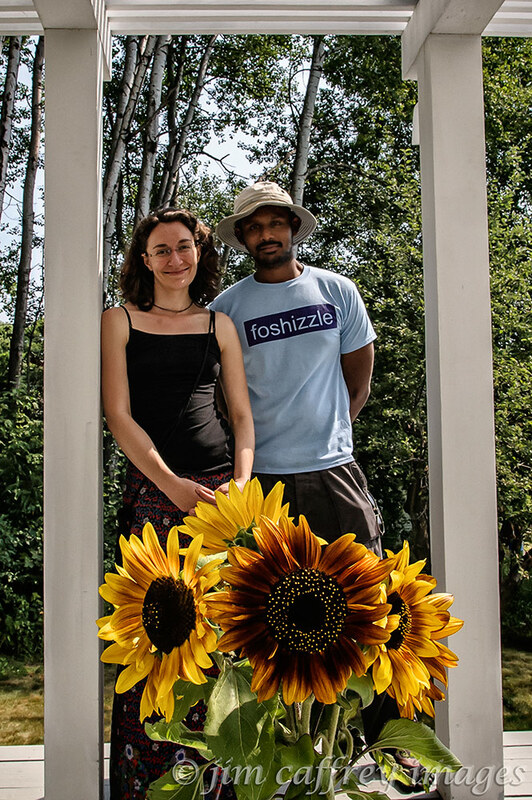 While relaxing on the porch of the house where we stayed, I made this image of them. In looking back over my development as photographer, I see that I have come full circle. I am technically more proficient than I was when I started, and the visual journey I have made has enabled me to add another layer to my vision. It’s evolution and that’s what it’s all about. This is a post about gear (particularly lenses) and why I chose it (them) to make a specific image. I teach a digital photography class at a nearby college and one of the things I cover in that class is the effect that the angle of view (the angle of coverage of the lens) can have on how the image is perceived by viewers. There are four categories: broad landscapes (wide angle), intimate landscapes (normal to short telephoto), compressed landscapes (mid-long telephotos) , and macro/close-ups (macro lens). 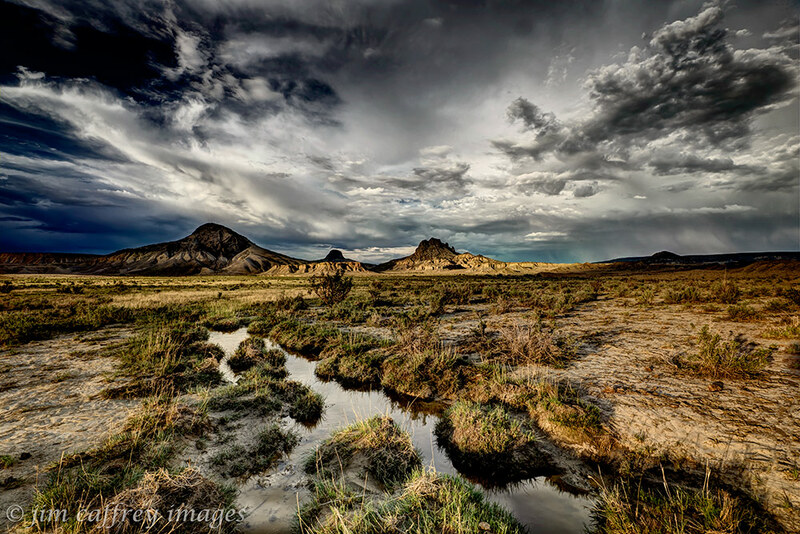 This image of a small wash full of water was made in the Rio Puerco Valley after a monsoon rain. It is an example of a broad landscape; the depth of the image from foreground to horizon is exaggerated. I used a wide angle zoom with an aperture of f 22 to give me the depth of field I needed to keep everything sharp. 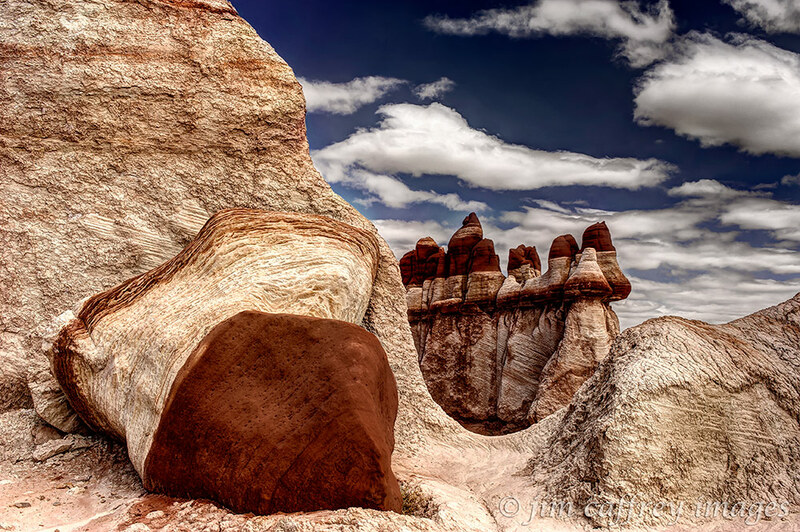 I made this image in Blue Canyon on the Hopi Reservation in northern Arizona. It is an intimate landscape; the area covered, side to side and front to back, is relatively small compared to the broad landscape. There is a feeling of immediacy or closeness about the image, as if it could fit in your living room. I used a medium telephoto zoom set at an aperture of f 11. 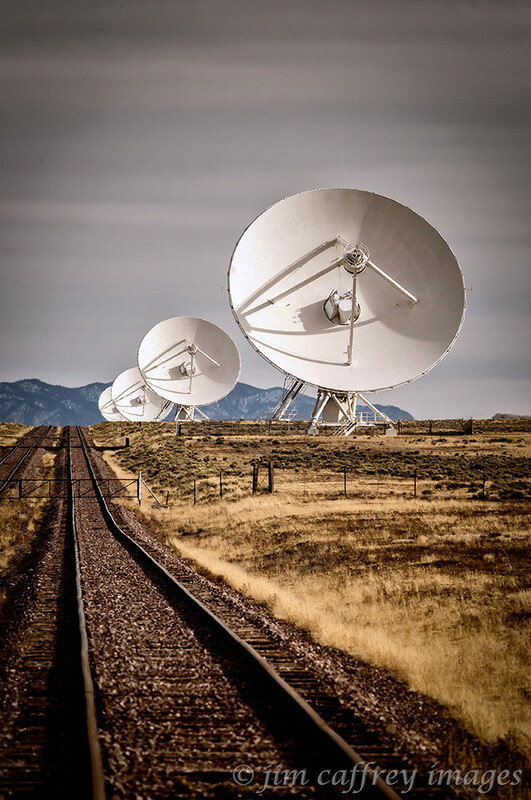 Using a telephoto lens causes an image to compress, so distant objects seem closer. A telephoto lens does not exaggerate the depth of the image the way a wide angle lens does. Instead, it causes elements to flatten, making the distance from foreground to horizon appear shorter, and making the elements in between appear more closely grouped. There is something about the the world that lies right at our feet that is compelling. Although it is normally common and quite ordinary, given a little attention and a skilled eye it can become extraordinary. This is the world of close-up or macro photography. There is no need to travel to exotic locales when there is an unending source of interesting subjects to be found in your own back yard. Nikon D300, Nikkor 105mm f2.8 macro; 1/60sec, f8, ISO 200, tripod. Wow! Another year fades into memory. 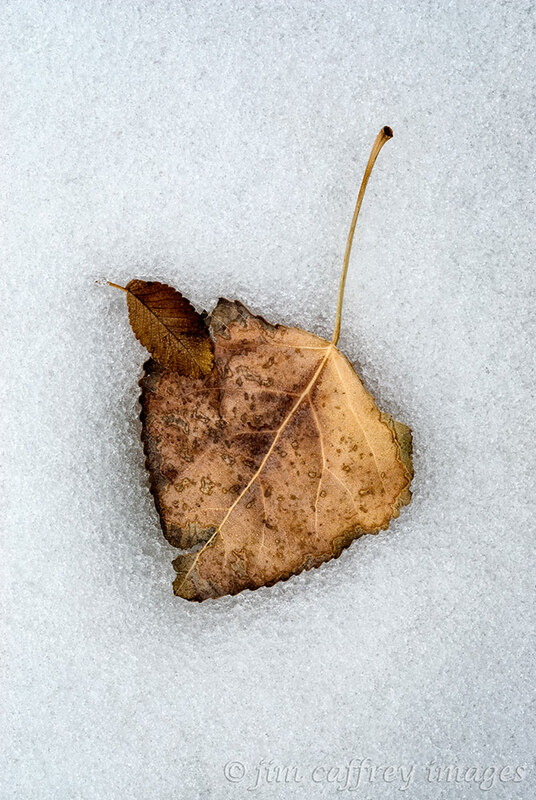 I have spent the last couple weeks editing the images I’ve made in 2013 with the goal of culling my favorite dozen. Image editing for me is a labor of love; I have a connection to my work, so picking “the best” out of hundreds candidates is not an easy task. 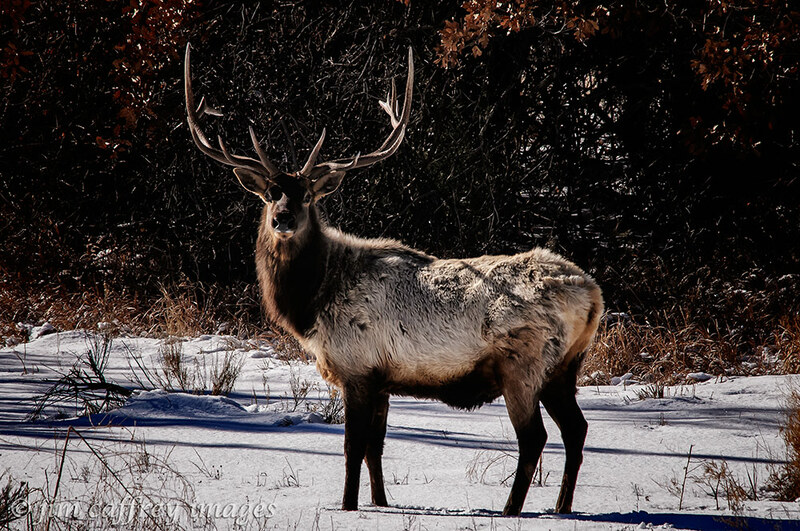 I knew from the time I made this photo of a bull elk in my yard on January 3rd that I was setting a high standard for the rest of the year. Also, not only was it serendipitous, but the image was a departure from my usual wide angle landscapes. I had been feeling for some time that my work had been stagnating, so I resolved then and there to take it in a new direction. In early February, I ventured into an area along US 550 that I had been looking at as a shooting location for some time. I was drawn by some red sandstone pinnacles that were visible from the highway. As I walked toward them, I came across this old section of road that is slowly eroding, being reclaimed by natural forces. The scene made me realize how impermanent our impact on nature really is. In the end, this is the image that stood out above the others I made that day. Again: serendipity. As the year progressed, I found myself revisiting some places I had been before. 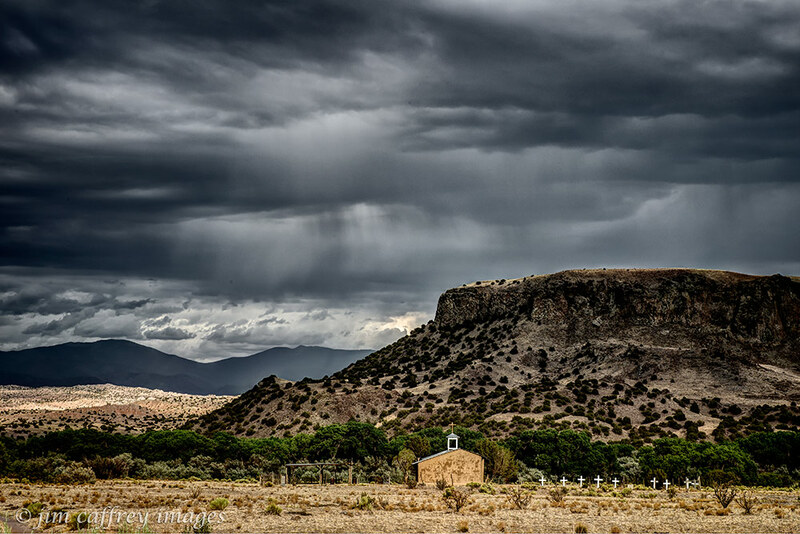 The image of the church on San Ildefonso Pueblo (a scene I had driven past countless times before) is more about the light than the subject matter. It is also a more visually compressed image than is usual for me due to my use of a longer focal length lens. 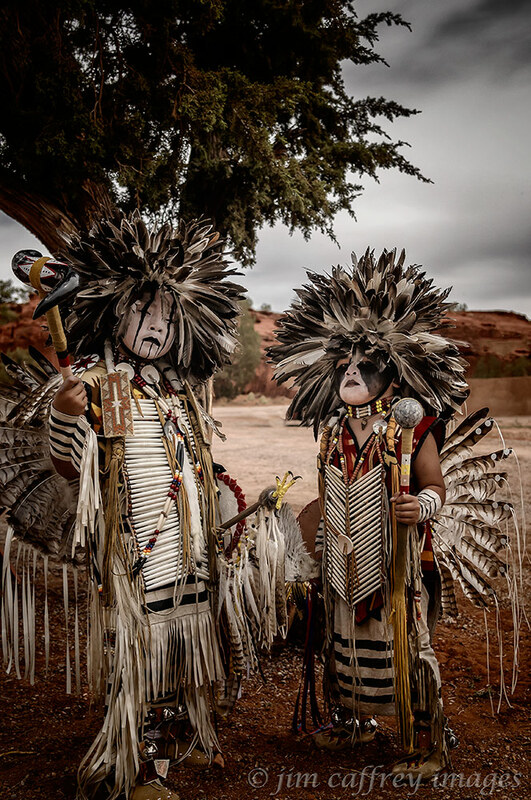 Every year at the end of May–Memorial Day Weekend to be exact–the Pueblo of Jemez hosts the Starfeather Pow Wow. Hundreds of native dancers from across the country come to dance and compete. I made hundreds of images that weekend, but this portrait of two brothers stood out. They are dressed in “dog soldier” head-dresses, hair-pipe breastplates, and feather bustles, all made by their father. Just before I released the shutter, I told them to give me some attitude. I think they did a pretty good job. 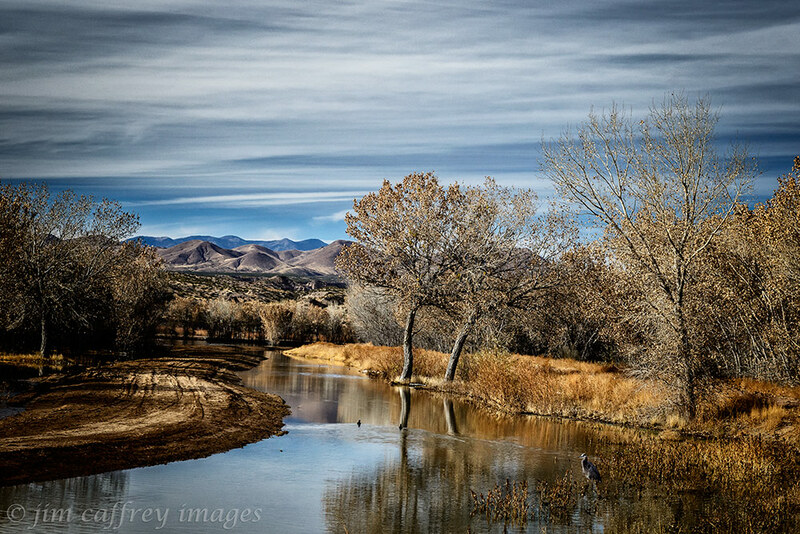 Anyone who is familiar with my work, knows that I spend a great deal of time in the Rio Puerco Valley. It was near the middle of July and the rains had just started after several months of searing heat and cloudless skies when I made this image. 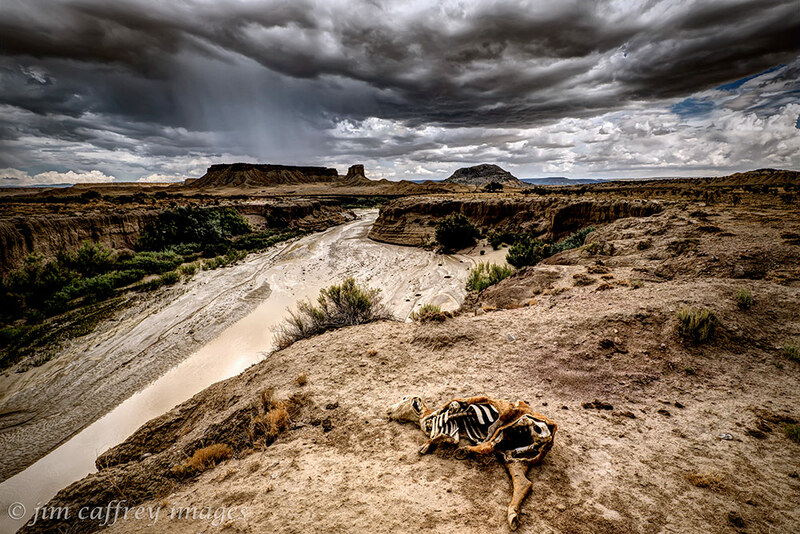 There are many possible causes for this animal’s demise, but the location of its desiccated remains along a now rain-filled wash and the rain falling from a heavy sky tells an ironic story about the uncertainty of life in this harsh environment. 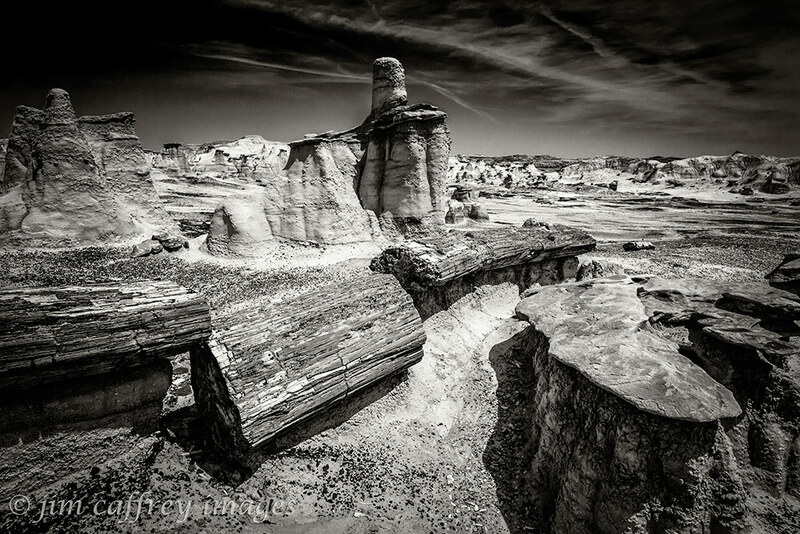 And speaking of harsh environments, the Bisti Wilderness in July can be a sobering place. The temperatures can soar to well over 100°F. I usually try to discourage clients from booking a photo tour during this time, but if the monsoons have started, it can be relatively pleasant and the cloudy skies lend a sense of drama to the scene. 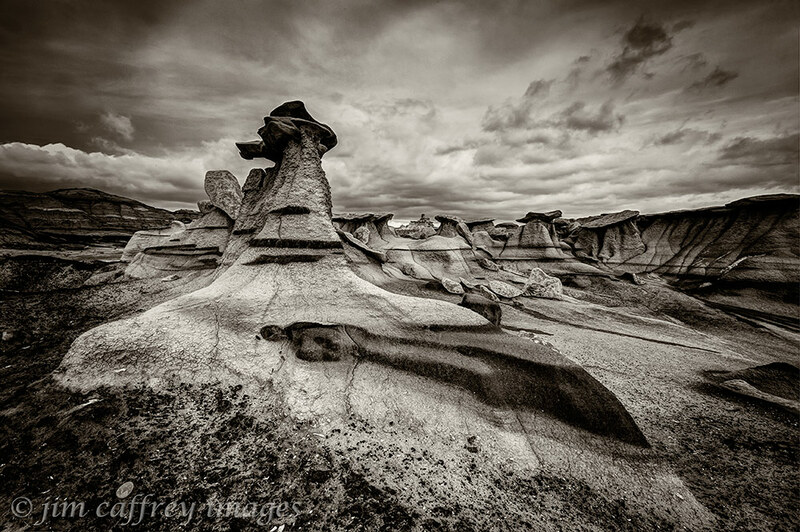 I made this image of one of my clients pondering the maze in the Brown Hoodoos section of the wilderness. From a land of parched earth to a place where water is omni-present; my travels took me to Wisconsin in August. 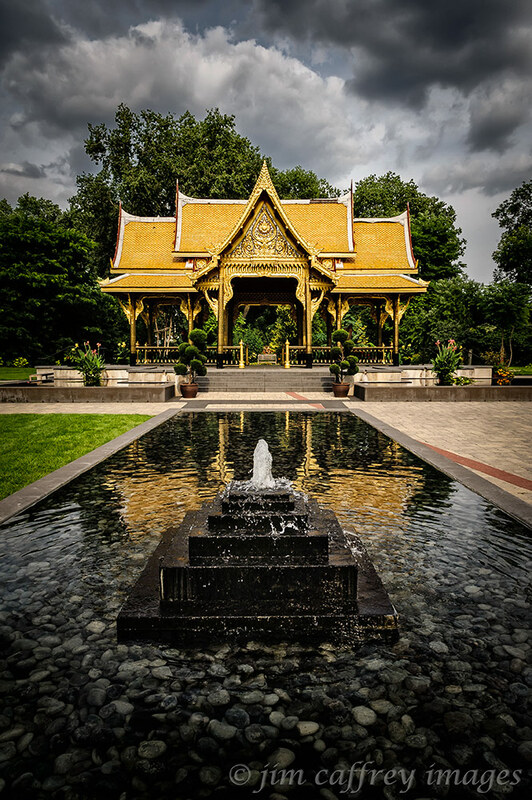 On a day-trip to Olbricht Botanical Gardens with my daughter, I made this image of the Thai Pagoda. Normally I steer clear of this kind of symmetry in a photograph, but the structure, and the entire environment seemed to demand it. Autumn is the best time to be in the badlands, especially if the atmosphere cooperates. 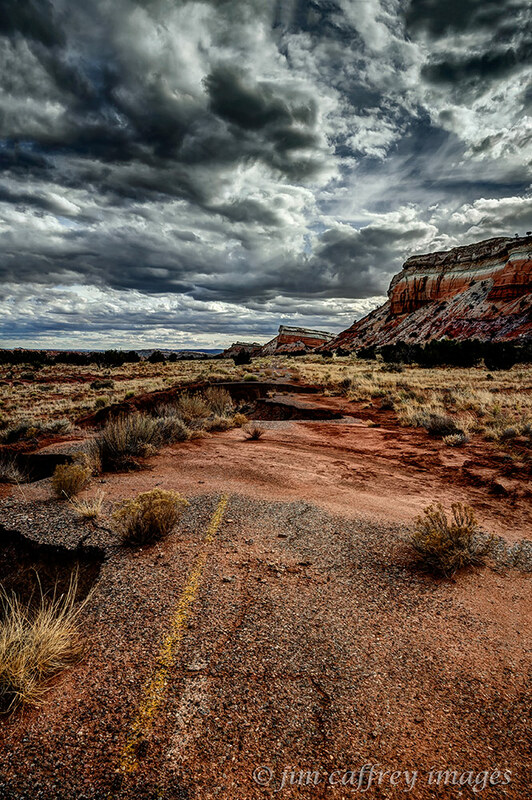 Even though the ground was soft and the washes were running from the rain, there were still cracks in the earth. It was as though the soil had a memory of the scorching it normally receives and refused to let go. After processing this image, I realized that it was best to convert it to black and white. During the months of September and October I spent a great deal of time photographing the trains of the Cumbres-Toltec narrow-gauge railroad which runs from Chama, New Mexico to Antonito, Colorado. I spent every weekend for nearly a month chasing the trains and the fall colors. 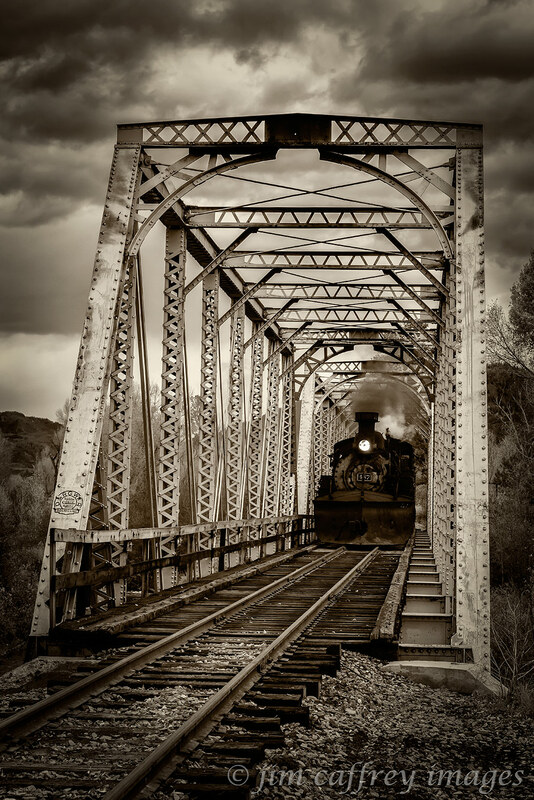 In the end, my favorite image had nothing to do with color and everything to do with the train, the track and the trestle. To most people, in the US anyway, November means thanksgiving. 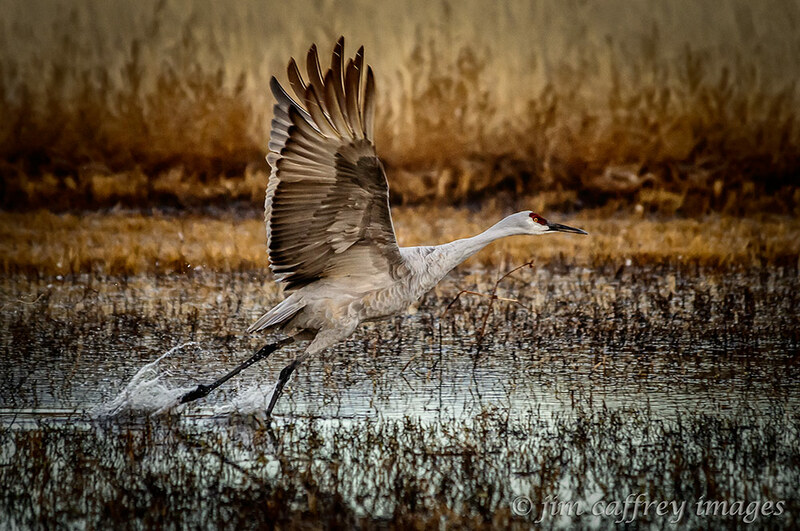 For me it is my annual trip to Bosque del Apache National Wildlife Refuge. Over the years, I have come to relish my time with the cranes, herons, geese, and other waterfowl that call the Bosque home during the winter months. Even though I have thousands of images of the birds flying, taking wing, landing, wading, eating, and doing whatever else it is that they do, I still managed to make two of my favorites there in 2013. This first is obvious and familiar: a crane in the process of taking off from one of the ponds to fly to the fields where he will spend the day foraging. The second is a departure from my normal Bosque images, but one that illustrates the reason that I keep returning year after year. In December I travelled by train to visit my oldest daughter (an adventure I wrote about in my previous blog entry). Chicago’s Union Station was a surprise to me. 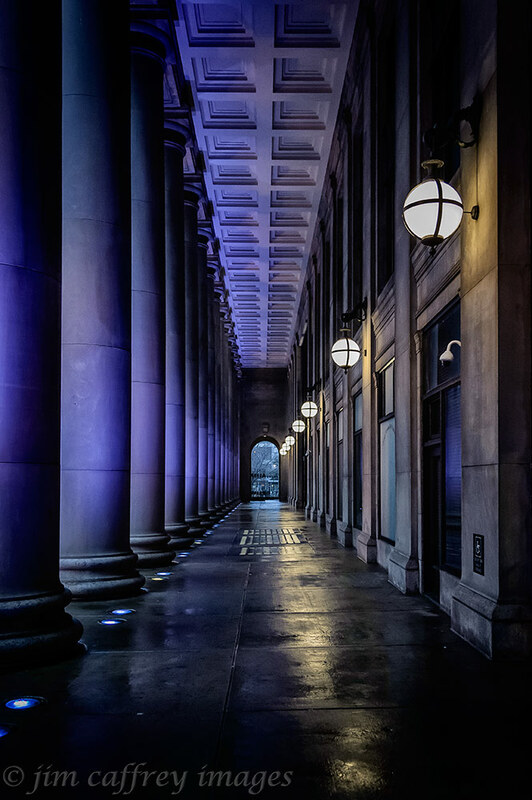 I made several images inside the station and when I wandered out the doors to Canal Street, I found this scene. I was immediately drawn by the fact that while some of the elements had symmetry–there’s that word again–some didn’t. And of course the cherry-on-top: the wet pavement reflecting the lights and columns.